I guess every toddler goes through a Finding Nemo stage. 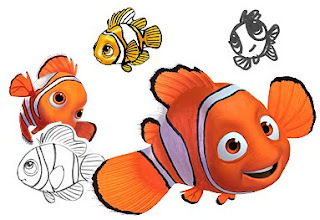 I've had several friends comment on how their kid was addicted to Nemo for some period of time. Alice started her Nemo stage right before Christmas. Just like with her obsession with Spirited Away, Alice will recite and enhance the dialogue along with the movie. When she first started watching, she called him Meno....which has progressed to Memo....and I'm sure she will eventually get the name right before she loses interest. As of right now, we find Nemo at least once a day during the week, and up to 3 times a day on the weekend.